Whenever we visit Disney, my goal is to make a mecca to one of the most amazing food items on this planet. Many times this does not occur but when it does, watch out! This food item is glorified with three little words and holds a very dear place in my heart. No Way Jose. So simple to say and yet so amazing to eat. Beaches & Cream is an old-fashioned ice cream and soda shop located at Disney’s Beach Club. The décor is very 50’s esq and seating inside is very limited. Beaches & Cream offers ice cream as well as a small menu of classic items. I have never had their food but, I have read some good reviews about it. The main reason we make this mecca is for none other than the No Way Jose. The No Way Jose is described as, “A Peanut Butter and Hot Fudge Delight with Chocolate and Vanilla Ice Cream, Peanut Butter and Chocolate Morsels, Whipped Cream and a Cherry.” Mmm. Just reading that description is making me salivate. The No Way Jose is served in a large glass cup and is more than plenty for two to share. I always say I am going to get my own but, somehow or another, I always share with Mommy. The only problem with this is that I don’t like whipped cream and she’s not a big fan of chocolate ice cream. The benefit of sharing is that I can only eat a small amount of ice cream to avoid a major stomach ache. It always works out in the end and I get to enjoy this magnificent creation. The main players of this creation are the hot fudge and melted peanut butter. The combination of the fresh, hot fudge with the creamy, hot peanut butter creates heaven on earth. The hot fudge is so fresh and with such a great all around flavor. The peanut butter is melted to the perfect consistency to provide ultimate flavor. 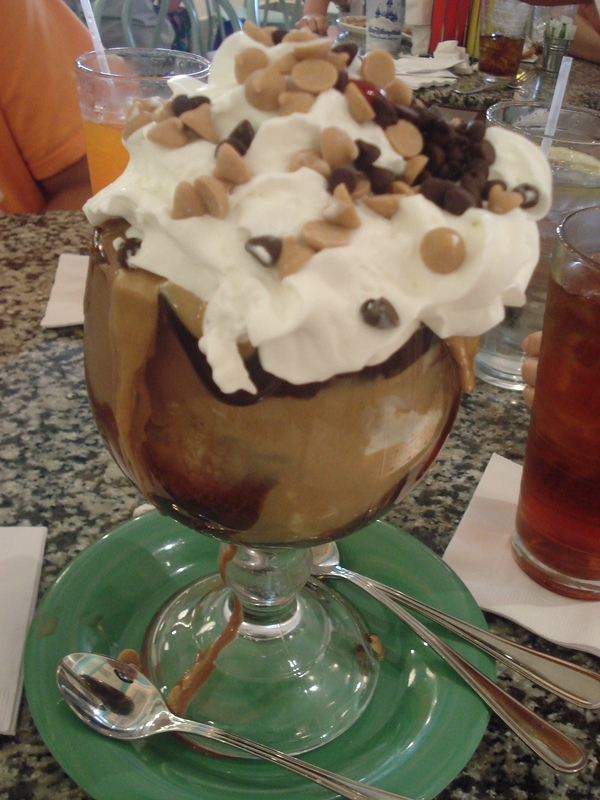 The hot fudge and peanut butter ooze out over the ice cream and down the glass bowl. If you are lucky, you get puddles of the two. I could honestly eat just a bowl of the hot fudge/peanut butter mixture and be totally content. No Way Jose is a great fellow who I am glad to enjoy every chance I get. Beaches & Cream really nails down all of the aspects of Jose to a tee. On this past visit, my family members got other offerings from Beaches & Cream and enjoyed them all. This is a great place to go to for a mid-day snack. By all means, make the mecca once, and you will be hooked.